Lords and Ladies is a card game where the goal is to build a powerful aristocratic family and while crushing rivals with gossip and betrayal. 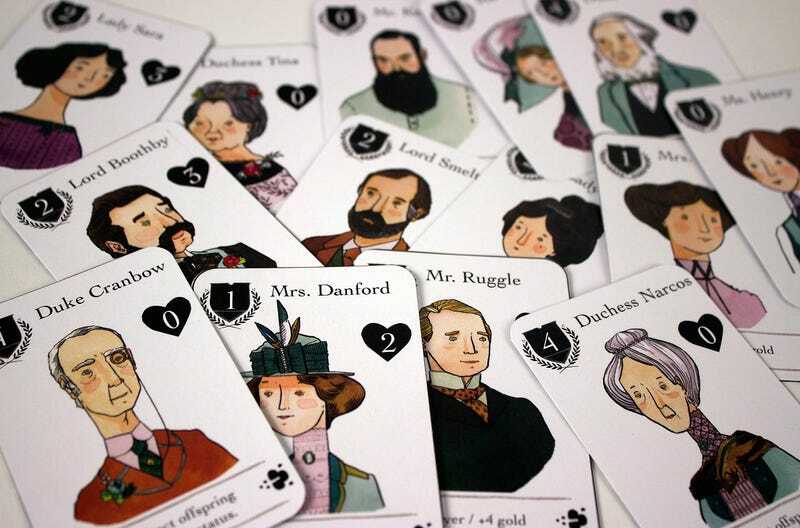 In Lords and Ladies, you control a turn-of-the-20th-century noble family and their servants. The game was created by a brother and sister team, Jason and Jen Corace. Inspired by their love of period dramas like Upstairs Downstairs and of course Downton Abbey, the duo decided that instead of just watching the drama unfold, they wanted to create a game where player’s could experience and make the drama themselves. The Foreign Affairs Expansion pack is included in the game. The expansion consists of 8 suitor cards with new powers to add variety and international intrigue to your game! The cards feature original pieces from many talented artists, including Carson Ellis, Eleanor Davis, Evah Fan, Marci Washington, Alec Thibodeau.